Bali Traditional Tour They performs shadowgraph 'Wayang Kulit'. 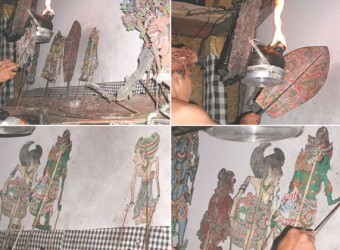 It is very famous traditional art in Indonesia, also strong connected with culture and religion. All dolls made from animal skin made by saint. Originally it was used for general ceremony in Bali. Shadow puppet show that I wanted to see. It`s a traditional play that is quite different from Japanese shadow puppet show! The puppet is unique and the shadow puppet player who spoke in the play was also amazing!! It was a day that made me more interested in Balinese Hinduism Before I got back to Japan, I bought the same puppet with the puppet used in shadow puppet.